Vikram David Amar is the Dean and Iwan Foundation Professor of Law at the University of Illinois College of Law on the Urbana-Champaign campus. 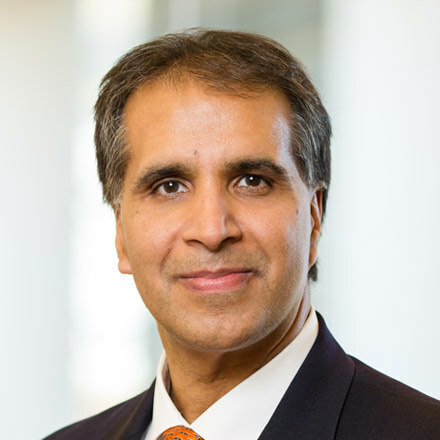 Immediately prior to taking the position at Illinois in 2015, Amar served as the Senior Associate Dean for Academic Affairs and a Professor of Law at the UC Davis School of Law. He has also had teaching stints at three other law schools affiliated with the University of California: the UC Berkeley School of Law; the UCLA School of Law; and Hastings College of the Law. He received a bachelor's degree in history from UC Berkeley and his JD from Yale, where he served as an articles editor for the Yale Law Journal. Upon graduating from law school in 1988, Dean Amar clerked for Judge William A. Norris of the United States Court of Appeals for the Ninth Circuit, and then for Justice Harry A. Blackmun of the United States Supreme Court. After that he spent a few years at Gibson, Dunn & Crutcher, devoting half of his time to federal white-collar criminal defense and the other half to complex civil litigation. Dean Amar writes, teaches and consults in the public law fields, especially constitutional law, civil procedure, and remedies. He is a co-author (along with Jonathan Varat) of Constitutional Law: Cases and Materials (Foundation Press, 15th ed. 2017), and is a co-author on a number of volumes of the Wright & Miller Federal Practice and Procedure Treatise (West Publishing Co.). In addition, he has published articles and essays in a variety of journals, including the Yale Law Journal, the Stanford Law Review, the Virginia Law Review, the California Law Review, the Cornell Law Review, the Vanderbilt Law Review, the William and Mary Law Review, the Minnesota Law Review, the UC Davis Law Review, the Hastings Law Journal, Constitutional Commentary, the Hastings Constitutional Law Quarterly, and the Green Bag Journal. Justia columnist and U.C., Davis law professor Vikram David Amar continues his two-part series of columns on the Supreme Court and affirmative action. In this column, Amar cites ways in which both the liberal and the conservative Justices have seemed to fall short of being truly intellectually honest on affirmative action issues. Amar focuses especially on what methodology the Court should use in affirmative action cases, and whether some affirmative action cases should not have been decided by the Court at all. More specifically, Amar looks at the use of originalist methodology in affirmative action cases, and issues of standing in such cases. Finally, he comments on the Fisher case, which is now before the Court, and involves the University of Texas’s admissions system. In Part One in a two-part series of columns, Justia columnist and U.C., Davis law professor Vikram Amar comments on the Supreme Court and affirmative action—a timely subject due to the Court's recent grant of review in the case of Fisher v. University of Texas, which involves affirmative action in college admissions. 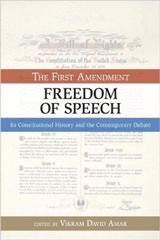 Amar contends that, when it comes to this explosive issue, the two wings of the Court have both engaged in intellectual dishonesty, and he details how the Justices adopted their current distrust: Amar charges the Court's liberals with an unwillingness to apply meaningful strict, or even intermediate, scrutiny to race-based programs; charges its conservatives with the unfair treatment of remedial rationales; and takes issue with some Justices' treatment of history and precedent. Amar's analysis includes some shockingly out-of-context quotes that Justices, over time, have used to try to make their points in this highly controversial area. Justia columnist Vikram David Amar and Justia guest columnist Alan Brownstein, both U.C., Davis law professors, comment on the recent controversy regarding Department of Health and Human Services regulations regarding the extent to which employees of religious organizations must be provided with insurance coverage for contraceptive services, as part of the insurance they obtain through their employment; and on President Obama’s proposed compromise. With Obama’s proposal drawing fire from both sides, Amar and Brownstein describe the framework in which they contend that the issue should be analyzed. Acknowledging both the serious religious liberty interest here and the value to many women of insurance that provides contraceptive access, Amar and Brownstein note that often, acknowledging such an interest also confers a benefit on the religious organization or person. (For instance, a true conscientious objector gains the benefit of not having to go to war, despite his sincerity and despite his not seeking out that benefit.) Here, if a religious institution does not have to cover contraceptive services, it not only vindicates its beliefs, but also saves money. Amar and Brownstein contend that part of the ideal approach to such questions would minimize such secular benefits of religious observance. They also note that another part of the ideal approach would be mitigate or spread the costs of honoring religious liberty, so that they do not fall disproportionately or heavily on an individual or group. Finally, they apply their ideal approach to the controversy over the HHS regulations, suggesting that religious organizations that are exempted from the regulations be asked to provide some kind of alternative to compliance—just as a conscientious objector in wartime would. Justia columnist and U.C., Davis law professor Vikram David Amar comments on an interesting Arizona case involving the question whether candidates for office can be required to be proficient in English. As Amar explains, the case arose from a dispute in San Luis, Arizona, a small southwestern city where the vast majority of the inhabitants are Mexican-American and where the Spanish language is pervasive. There, the Mayor has challenged the eligibility of a candidate for City Council, Alejandrina Cabrera, and has sought to block her name from the ballot on the ground that she is not proficient in English. In so doing, the Mayor invoked longstanding Arizona law. After an expert found Cabrera not to be sufficiently proficient in English, her name was removed from the ballot. She now seeks relief from the Arizona Supreme Court. Amar considers precedents and analogies that are relevant to whether Cabrera should win her case. The “Americans Elect” Movement to Reform Presidential Elections: How Will It Work? And, Is It a Wise Idea? Justia columnist and U.C., Davis law professor Vikram David Amar describes and comments on the “Americans Elect” movement. As Amar explains, the movement is striving to put a “nonpartisan” presidential/vice-presidential candidate slate—determined by citizens around the country who will participate in an “online convention” next year—on the ballot in all 50 states before next November’s presidential election. The slate will be “nonpartisan” in that the top online vote-getter, who will be the presidential candidate, must choose a vice-presidential candidate from another party. As Amar notes, nominees can be members of any political party, and indeed could (judging from the organization’s website) presumably be candidates in the Democratic or Republican primary processes. He raises several issues regarding “Americans Elect,” including its potential for its candidate to act as a spoiler by not having enough votes to win, but having enough votes to tip the balance between two major-party candidates—recalling Ralph Nader’s controversial role in Florida in Election 2000. In addition, Amar contends that while Americans Elect’s idea of requiring the top vote-getter to pick an opposite-party running mate is well-intentioned, it seems to rest on some misconceptions about whether mandating lack of party uniformity will turn out to be a good idea. The California Supreme Court Rules that Prop. 8’s Proponents Have Standing to Defend the Initiative: What Does That Mean in the Ninth Circuit and U.S. Supreme Court? Justia columnist Vikram David Amar, and Justia guest columnist Alan Brownstein, both U.C., Davis law professors, comment on the latest ruling in the litigation regarding Proposition 8, the California anti-gay-marriage initiative. Amar and Brownstein begin by noting that this ruling holds that the initiative’s proponents have the authority to defend the initiative in California state court, now that elected representatives have declined to do so. They then summarize all the Prop. 8 litigation that has occurred thus far. In addition, they explain what may happen if this case reaches the U.S Supreme Court based on the standing issue it presents (that is, the issue of whether the parties at issue are legally able to bring this case). They cover a reason why the Supreme Court might decline to find federal standing: until now, initiative proponents have not been elected or specifically deputized by the people. Finally, they briefly discuss some other troubling questions regarding the Prop. 8 litigation that the California ruling did not address. Justia columnist and U.C., Davis law professor Vikram David Amar comments on a recent, rare Supreme Court summary reversal. A summary reversal occurs when the Court summarily grants review and then reverses the federal circuit court’s decision without the benefit of full written briefs and oral arguments. In this instance, Amar suggests that the Court may have opted for summary reversal in light of its apparent annoyance with the U.S. Court of Appeals for the Ninth Circuit. In a criminal case in which a grandmother was accused of shaking her grandson to death, her defense was that the child died, instead, of Sudden Infant Death Syndrome. The Ninth Circuit sided with the grandmother, and reversed the conviction. The Supreme Court then twice directed the Ninth Circuit to reconsider its reversal, but the Ninth Circuit twice reaffirmed that reversal. Amar suggests that Supreme Court annoyance with the Ninth Circuit, which is the subject of a disproportionate number of summary reversals, may have led the Supreme Court, this time, to opt for summary reversal in this case, as well. Justia columnist and U.C. Davis law professor Vikram David Amar comments on an interesting case about affirmative action, in which U.S. Supreme Court review is being sought. As he explains, the case asks the question whether a rejected applicant who challenges an affirmative-action program as unconstitutional must prove that, without the affirmative-action program, he or she would have been admitted. Focusing on two key prior Supreme Court cases, Amar notes that there is another possible standard to be applied here—one under which the applicant would not need to show that he or she would have been admitted under the program, but would simply need to assert that he or she had applied, and thus that he or she had been harmed by being considered under an unconstitutional set of rules. Carefully parsing the Court’s precedents, Amar considers whether ambiguous prior decisions are best seen as involving substantive or jurisdictional issues. Justia columnist and U.C. Davis law professor Vikram David Amar comments on a case that the Supreme Court will take up this November. As he explains, the case potentially raises thorny questions regarding two important topics: (1) the relationship between Congress and the President with respect to American foreign policy in the Middle East; and (2) the power (or lack of power) of federal courts to weigh in on such matters, pursuant to the Court’s “political question” doctrine. The case, MBZ v. Clinton (that is, Secretary of State Hillary Clinton), involves a 2002 law passed by Congress that, among other things, requires the Secretary of State, upon the request of a citizen or the citizen’s legal guardian, to record the place of birth for U.S. citizens born in the city of Jerusalem “as Israel.” President Bush signed the law into effect, but issued a signing statement to disclaim the legal effect of part of the law he was signing—on the ground that forcing the State Department to record Jerusalem births as being in Israel would impermissibly interfere with the President’s constitutional power to formulate and speak on behalf of American foreign policy. The plaintiffs in the M.B.Z. lawsuit seek to force the executive branch to follow the terms of the statute, notwithstanding the signing statement’s disclaimer. 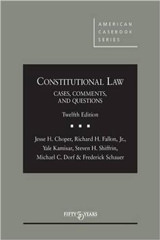 Whether they can do so, Amar explains, depends on whether the case at issue triggers the political question doctrine, under which there are some questions on which even the U.S. Supreme Court cannot rule, on the ground that they are properly resolved by one of the U.S. government’s political branches, rather than by the Court. Justia columnist and U.C. Davis law professor Vikram David Amar comments on Pennsylvania and Nebraska proposals to change the allocation of those states’ electoral college votes. Amar expresses concern that, while the proposals may not be illegal, they are nevertheless deeply problematic and antithetical to basic principles underlying American democracy. The Pennsylvania proposal would alter the winner-take-all approach to the states’ electoral college votes, and instead would allocate the lion’s share of those votes based on how many congressional districts a given candidate won. Meanwhile, in Nebraska, another proposal suggests the opposite change: from a district-by-district approach to winner-take-all. Amar points out that each of these proposals, authored by Republicans, has been put forward now for a plainly partisan reason: to reduce President Obama’s chances of re-election. Amar contends that this partisan motive should make us skeptical of the proposals, which would take effect immediately, much more so than if they were to take effect at a time in the future when their authors could not so easily determine what their partisan effect might be. Finally, Amar also considers whether Bush v. Gore ought to be deemed relevant to the controversy over the Pennsylvania and Nebraska proposals. Is Rick Perry Right That the Seventeenth Amendment Was a Mistake? Justia columnist Vikram David Amar and Justia guest columnist Alan Brownstein, both U.C. Davis law professors, assess the claim of Texas governor and presidential candidate Rick Perry that the U.S. Constitution’s Seventeenth Amendment—which provides for the direct election of U.S. Senators—was a mistake. Amar and Brownstein explain the original Constitution’s provision for state legislative election of Senators, and the thinking behind it, and the genesis of the Seventeenth Amendment. They also assess the Amendment’s costs, but note that if it were repealed, there would be costs to that decision, as well. Justia columnist and U.C. Davis law professor Vikram David Amar comments on an affirmative action decision from the U.S. Court of Appeals for the Fifth Circuit in which the Supreme Court may well grant review. Amar explains why, if the High Court does indeed take the case, its decision may substantially alter constitutional law relating to affirmative action in the context of educational admissions. In addition, Amar notes that this case, if taken up by the Court, may illustrate the very considerable power that Justice Anthony Kennedy now wields. Amar also provides thorough background to allow the reader to put this case, and the issues it raises, in the context of prior precedents relating to affirmative action in admissions, such as Bakke, Hopwood, Grutter, and Gratz. Justia columnist and U.C. Davis law professor Vikram David Amar comments on the recent decision by a divided three-judge panel of the U.S. Court of Appeals for the Eleventh Circuit, striking down Obamacare’s “individual mandate” provision, which requires each person to obtain health insurance coverage or pay a sum of money to the U.S. Treasury. 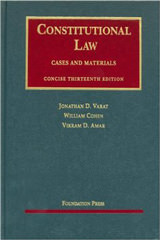 Amar considers and responds to the most important Commerce Clause arguments that the panel majority invoked: (1) the unprecedented nature of the mandate in federal law; (2) the lack of a requirement in the mandate provision that each regulated individual be doing anything that affects the economy; (3) the related problem that if Congress could mandate purchase of healthcare, there would be no stopping point to federal power; and (4) the fact that insurance and healthcare are matters of traditional state concern. The National Popular Vote Bill Proposal in California, and Ultimately (Perhaps) in Washington D.C.
Justia columnist and U.C., Davis, law professor Vikram David Amar argues in favor of America’s adoption of the National Popular Vote (“NPV”) proposal. As Amar notes, California may soon adopt the proposal, and if it does so, that would be a major development in the movement towards a direct national popular election for the Presidency. The essential idea, he explains, is to get states that, together, possess a sufficient number of electoral votes to sign onto an agreement that would require each signatory state to cast its electoral college votes not for the candidate who may have prevailed in that state, but rather for the candidate who won the most popular votes nationally. Amar points out that this idea could be put into effect without a constitutional amendment, considers the details of how the NPV proposal might work, addresses some possible criticisms, and notes that requiring Congressional approval for the proposal to take effect might be wise. Justia columnist and U.C. Davis law professor Vikram David Amar completes his two-part series of columns on two key decisions from the U.S. Court of Appeals for the Sixth Circuit. His last column focused on the Circuit’s Obamacare ruling; this one focuses on the Circuit’s ruling on an issue relating to affirmative action. Amar describes two different lines of Supreme Court precedent that offer different ways of analyzing affirmative action cases, and considers the possibility that the Court will take the opportunity—by reviewing this or another lower-court decision—to clean up apparent tensions between these two lines of High Court cases. Justia columnist and U.C., Davis law professor Vikram Amar begins a two-part series on two important recent rulings by the U.S. Court of Appeals for the Sixth Circuit, both of which may end up before the Supreme Court. In this first column, Amar comments on the Sixth Circuit ruling that upheld Obamacare—citing a number of factors that make the decision noteworthy. These factors include a conservative judge's vote to uphold Obamacare; that same judge's use of broad reasoning in doing so; the fact that the dissenter was a district court judge; the decision's timing; and the arguments the two judges in the majority could have made, but declined to make, in support of the statute.